The Glee electric shower from the taps and showers expert, Bristan, With a modern, minimalist design and a smart digital temperature display, Glee offers the perfect combination of style and practicality. A push on/off button and separate flow and temperature dials make it really easy to use, while its smooth flat surface makes it nice and easy to clean. Not only that, but its universal footprint means that it will cover the space left by your old shower and has five water and electric inlet points (most showers only have two) making it really easy to install. Consistent showering temperature is provided. The temperature stabilising device compensates for changes in the water pressure caused by other household fittings. On/Off is operated by Push Button, ensuring temperature setting remains unaffected after each use. Safety warning letters in a display panel indicate low pressure and therefore the shower should be turned off until pressure resumes. 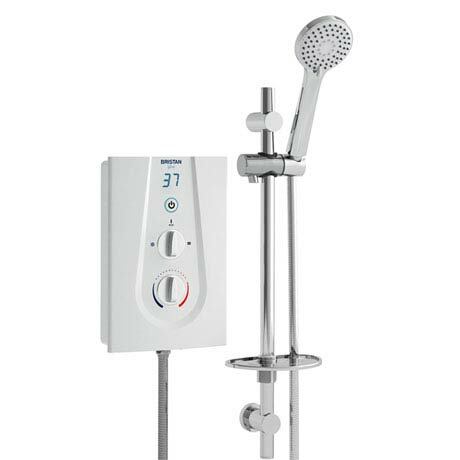 This shower is supplied with an adjustable riser kit and 3 mode rub-clean handset. The riser has a built in soap tray & integral hose retainer.